While I personally have yet to strongly dislike any Pixar release, the animation powerhouse clearly does have two tiers of films: emotional films with powerhouse stories like “Toy Story 3” or lightweight breezy fun pictures like “Cars 2.” “Brave,” resisting easy classification within the Pixar canon, straddles a very happy median between the two. The humor is definitely more of the “Cars” variety, zany and perhaps a little sophomorically silly. Though it’s not a tearjerker like the “Toy Story” movies, “Brave” most definitely boasts the present, beating Pixar heart that has made them the preeminent name in animation for nearly two decades. Boasting a spunky, independent hero looking for satisfaction, wisdom, and maturity who just happens to be a girl also makes “Brave” the feminist movie of the year. The film doesn’t forcibly adhere to any of the conventional coming-of-age conventions for girls, nor does it degrade her femininity by deriving all her strength from manliness. It’s a nice reminder that self-discovery and self-realization is not relegated to one gender. The USPS announced today that in 2011, they will issue Pixar-themed stamps! There will be 5 stamps in the collection from the “Toy Story” movies, “Cars,” “Ratatouille,” “Wall-E,” and “Up.” I’ll probably run out and buy a bunch next year and forever make my letters festive, but I have to hesitate some since postage is always going up! I’m ecstatic that these stamps are going to be arriving on my mail next year! It makes me excited to receive snail mail. But I do have to point this out – where is “Monsters Inc.” among the stamps? It’s a lot better than most of the movies that made the stamps! Rejoice! “Toy Story 3” opens today! However, it will be without one familiar face. 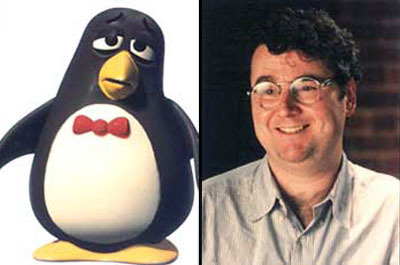 Wheezy, the lovable penguin that Woody risks his life to rescue, does not appear in the latest installment of the beloved series. His absence is quickly explained, but it’s easy to let out a sad “aww” when the news is broken. Why is there no Wheezy? Unfortunately, there’s some tragedy behind that. The movie “Cars,” which he co-directed, was dedicated to his memory. And I’d like to dedicate today’s random factoid to Ranft, who stole our hearts with Wheezy 11 years ago. As part of my tribute, enjoy Wheezy’s song from the end of “Toy Story 2” (although it’s sung by Robert Goulet – also RIP – and not Ranft). Pixar and “Toy Story” have really come to define the cinematic landscape for animation in my lifetime. When I was 3 years old in 1995, they rolled out the first full-length animated film made entirely with computers. At the time, it was an anomaly. Now, I can hardly imagine a world where every movie isn’t made with computers. In some ways, you could even say I’ve grown up with “Toy Story.” It’s a movie whose characters I have grown very attached to, and not just on the screen. I had countless “Toy Story” action figures and toys in my childhood, from the hand puppet Rex and Hammy to the stuffed Woody to the Buzz Lightyear transformer. Like any good toy does, they provided countless hours of entertainment and stimulation for my imagination. So needless to say, I had the highest of expectations for Pixar to once again create not just a movie but another authentic piece of childhood bliss enjoyable for kids and kids at heart. The “Toy Story” crew has been up in the attic for 11 years, and they could have easily gathered some dust over time. But as soon as they appear on screen, they win you over with a charm that feels fresh out of the box. Pixar preserved them all in near mint condition, and “Toy Story 3” quickly reminds you how easy it is to fall in love all over again with these plastic pals. Pixar once again demonstrates their incredible capacity for creativity by keeping the story king and fully fleshing out characters that we can really care about. Their simple formula has worked flawlessly for 15 years and has never gotten rusty. But the Pixar magic isn’t limited to the screen. The spirit of the movie spreads through the theater, inspiring a new generation of “Toy Story” fans and reminding all of the untold power imagination can have.